I am still trying to come to grips with a schedule. I am still struggling to use the printer. Part of my problem is the absurdly stupid fact that the printer is out of ink and I need to change the cartridge. It is enough of a deterrent that I keep thinking I'll change it later. Stupid. Anyway, after my panic of last week, I have all of a sudden been granted the ability to think about homeschooling in a concrete way. When I had hours and hours at work to do whatever I liked, I couldn't make my brain plan what I only had the vaguest concepts about doing. Homeschooling mothers would invite me to look at their materials and I would smile and nod and glance through it without the slightest idea of what I was looking for. Even when I was finally home from work, the whole homeschool planning thing was elusive. But now, as I begin to discover what our days will be like with me at home with them, I am suddenly able to make decisions about curriculum. In math, both girls were working in Khan Academy until Olivia, inconveniently, finished the second grade program. However, she is definitely not ready to move on to third grade math. The basic addition and subtraction facts are not cemented in her mind yet. She understands the concepts and gets the right answers, but doesn't respond immediately and needs more drill. Grace is working through the 5th grade level of Khan and enjoying it. She will spend hours working on math if I let her. I sometimes let her. I think Khan is a solid program, but my basic complaint is that it grants mastery status without enough drill. If you luck out and get four or five questions right in a row on a topic, they say you have mastered it. Well, you might have or you might not have. It makes me nervous, anyway. I looked at the Saxon Math and I honestly had to say, even if I think this might be a superior math program, I do not have the wherewithal right now to sit and whittle down eleventy billion problems a lesson into a workable number of problems for us. So maybe Saxon in the future, but not this year. A friend has a collection of Life of Fred that she has graciously allowed me to borrow. I want both girls to work through at their own pace. Grace is less than thrilled with this idea so I am not sure how hard I am going to push it. She is deeply offended by the notion of starting at the beginning because that is what the program requires. She is also unnerved by only having a handful of questions to answer in any given lesson. I just want her to have an alternative version of math since I don't think Khan drills enough. But she so loves the Khan. So we shall see. I am going to work with Olivia through Life of Fred and then I ordered a Seton 2nd grade math workbook to give her extra practice where I don't have to sit with her. Just drill. In reading, I am sitting with Olivia while she reads through the primary Pathway readers. I have been told that in 7th or 8th grade, they turn into anti-Catholic screeds, but the early grades are sweet stories about a family where it is normative for children to do chores and obey their parents and play with their siblings. So I like it. With Grace, reading is a something of a discipline problem. If it's a book, she will read it to the exclusion of all life including sleep and meals. I don't have a solid program for her except to hand her an assortment of books and say, "Here, read this." And she will. For Grammar, I decided to get Grace the Fix-It workbook from IEW. It is a program where you examine a story line-by-line so you get grammar in the real world and not just artificial sentences. We have the first book of the Memoria Press Cursive program that both girls have been hitting licks at for two years. We will now buckle down and actually work the program. I expect to have to get Book 2 in the spring. (Also need the printer because we only have one book.) In conjunction with the handwriting, I got them each an appropriate copybook. The second level book for Olivia and the Latin Cursive for Grace. In social studies, I bought these map workbooks in Grades 2, 4, and 5 for them to practice geography and map reading. My thought is that they will do math, reading, and grammar everyday and alternate handwriting and maps Monday through Thursday. I will also add some time for readalouds every day and I want them to write a little something about what we read once a week. They are also going to Grandma's on most Fridays to learn sewing and cooking. The girls and I have talked and they have indicated that they would like a checklist to work from everyday. I need to create a template and then I will be able to actually plan weeks at a time instead of this catch-as-catch-can that has been our model these past few weeks. I have kept it no secret that one of the reasons I was the one who was chosen to go out and earn a salary is because housecleaning is not my forte. My standards are high; my technique is amateur; my working tempo is largo. It is difficult for me to walk away unless perfection reigns. Perfection never reigns so I perpetually feel behind and substandard and spend an eon getting there. 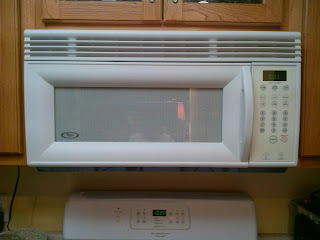 I have a history with cleaning microwaves. 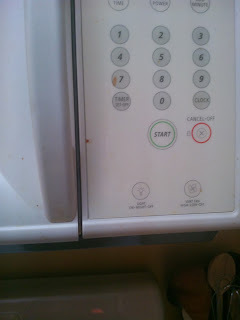 When I took time off of work before Marian was born, I desperately spent two hours cleaning every crevice of our microwave after I had cried bitter tears over the fact the midwife was going to see our dirty microwave. This was the sum total of my nesting activity. 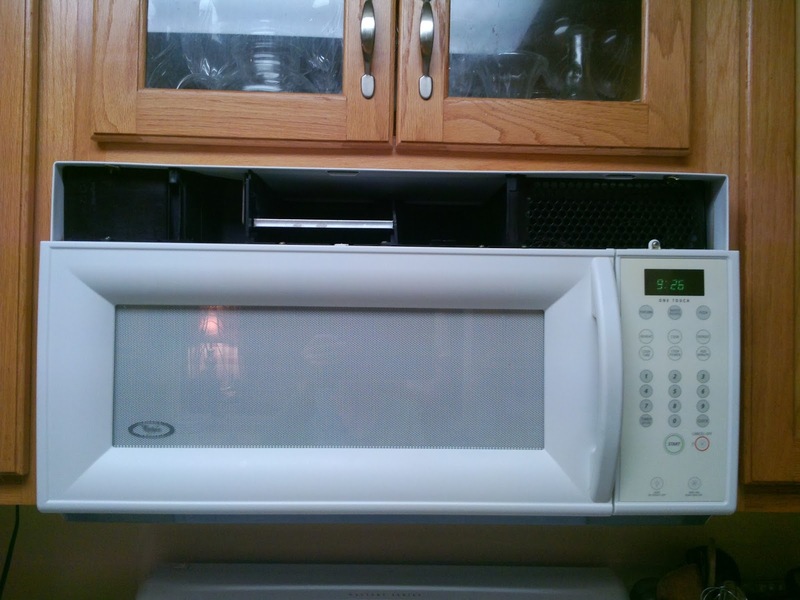 I put together a cleaning solution of vinegar and dishsoap, zapped it in the microwave, and commenced with scrubbing every surface of the microwave, starting at the top. Order of operations, of course. I soaked a washcloth and worked until I needed to rinse and resoak the washcloth. Repeat until my bowl of solution was empty and then mix up some more. 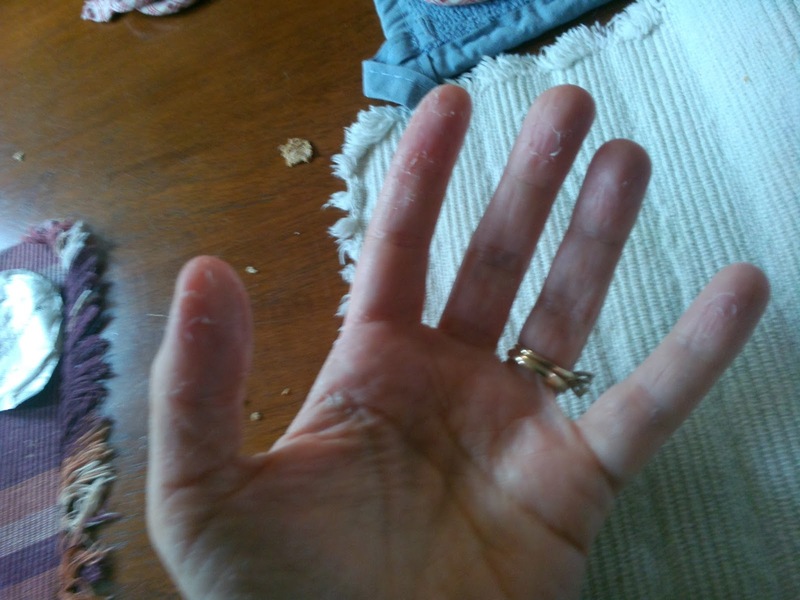 As I worked, I kept remarking that the vinegar was burning my hands. I would rinse my hands in some water and then soldier on. After working for 90 solid minutes, I had to quit, but I sadly was not done. 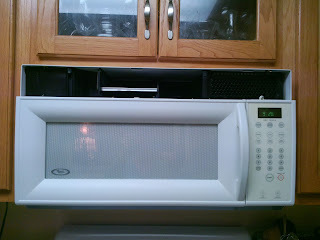 Here is the microwave in its sad, half finished condition. This grate vexes me. There is grease in there. I see it. It needs to be scrubbed away. It won't dissolve on its own. My fingers are too big to get in there. I know it is still dirty. I *know* it is. I don't need to spend multiple hours figuring out how to clean what I cannot reach, right? Right? The next day and the next, I could not finish the job. Then a strange thing began to happen: my hands began to peel. I may or may not have inadvertently given my hands a chemical peel with the vinegar. My skin may have been peeling so badly that it may or may not have been referred to as "hand dandruff." I learned my lesson. Soaking bare skin in soap and vinegar for over an hour is maybe not a good idea. I decided I needed kitchen gloves. At the grocery, I picked up a fashionable pair. On sale! Now I could finish the job! 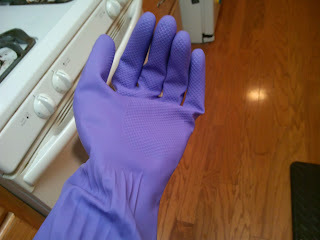 I scrubbed for probably another hour. Dave could smell the vinegar wafting out of the house as he drove by on the lawn mower. I broke off the lightbulb underneath as I unscrewed it to change it out. After a while, I deemed the job 'good enough.' It is not perfect. The lightbulb base needs removed and replaced. 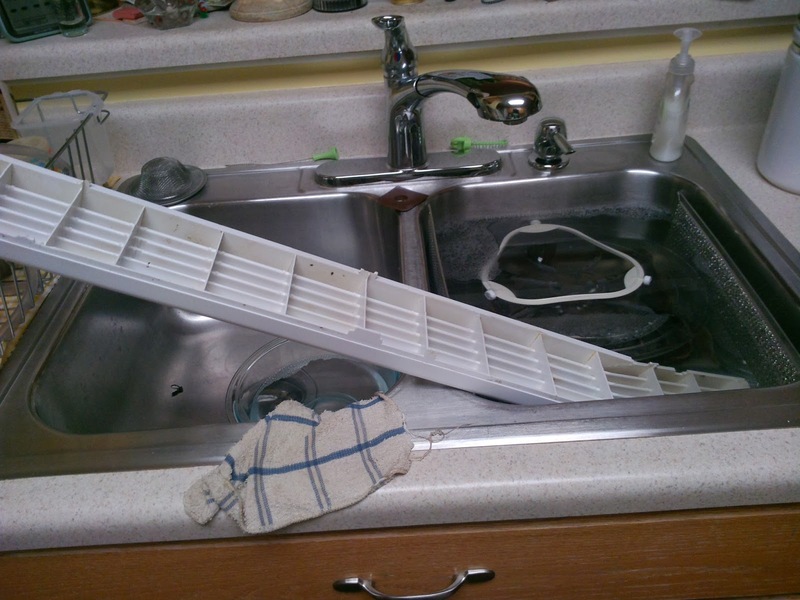 There is still grease in the grate that I cannot reach, but I will not make perfect the enemy of good. 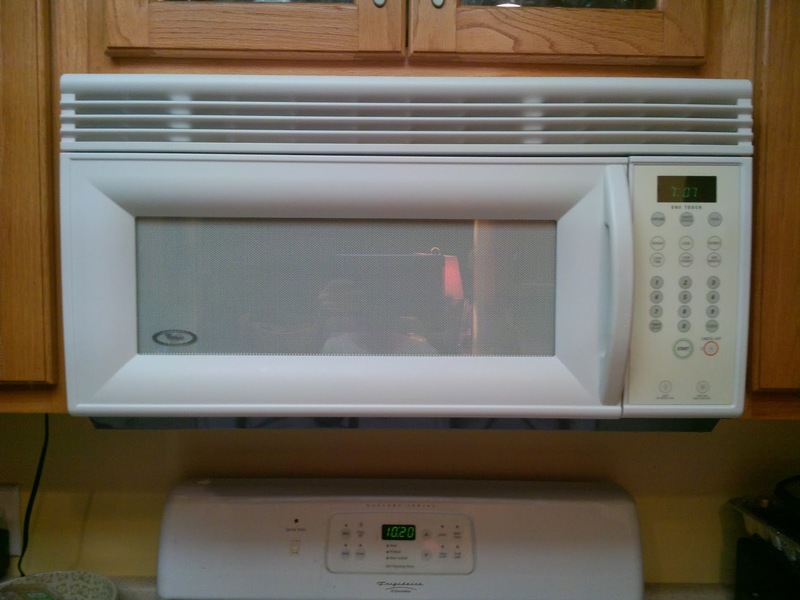 I consider the microwave finished. Isn't it beautiful! I probably spent three hours working on it. Sigh. I never claimed efficiency, but it is clean. So I regaled a friend with the tale of the epic microwave cleaning and she wondered exactly how much vinegar I was using. I showed her my bowl that I filled with vinegar solution multiple times in the course of the job. After regaining her ability of speech, she told me I should just spritz it on with a spray bottle, let it rest a minute, and then wipe it up. 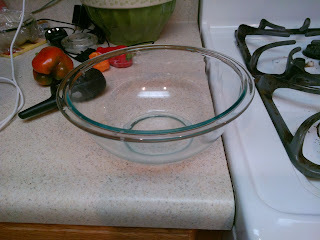 That I shouldn't need more than a 1/4 cup of vinegar to get the job finished. 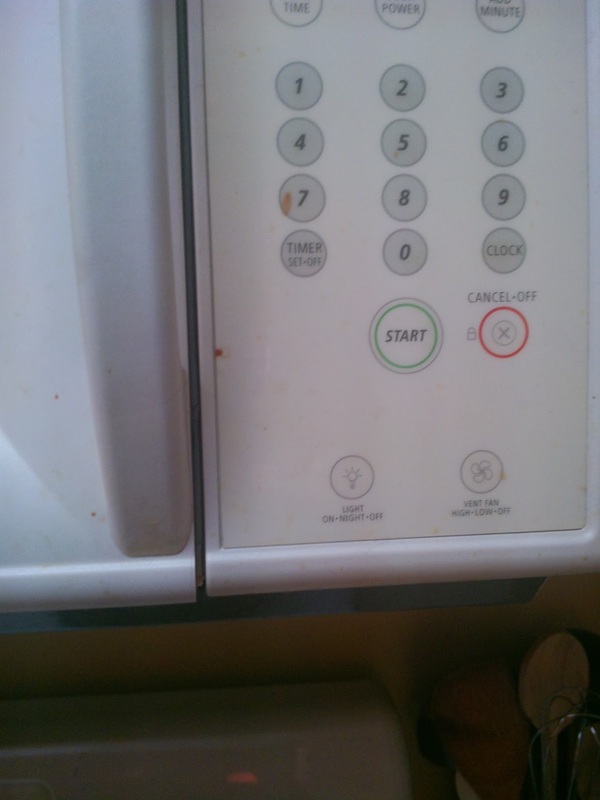 Apparently using a quart of vinegar to clean a microwave is overkill. Um, oops? It has been four weeks since I was at work. I promised myself I would not try to impose any kind of schedule for four weeks. I would not impose a bedtime. I would not set an alarm. I would not force the school planning. We would do a little math and a little reading every day. People ask how homeschooling is going and I mumble about a soft start. My focus has been on piddling and cleaning the house. Day by day, I have awoken without an alarm, done a bit of schooling, done a bit of cleaning, stayed up as late as I cared to, and basically done what I wanted. Wow, we need a schedule. Oh, how I wish I was a morning person! The truth is I struggle to be functional in the morning. I wake up groggy even when I have had plenty of sleep. I have known this about myself for a long time (forever), but I had hoped it was just a remnant of sleep deprivation. It's not. I hoped coffee would fix it. It doesn't. Left to my own devices, I am dressed and ready to face the day at about 11:30am, just in time to fix lunch. The day evaporates. If I could run on my own schedule, it wouldn't be a problem, but the children need me to stop spending half the morning staring into the middle distance. I need to establish our new normal. An established bedtime. Going to sleep whenever is just pushing my day around. I need to be off the computer by 10pm to give my brain time to shut off so I can go to sleep around 11pm. Set the morning alarm. Sob. I still need an alarm in the morning, but I can set it reasonably and not the crazy early of worklife. I am thinking 6:45am might be a good wake up time. I need to say morning prayer before I do anything else. When I say I'll get back to it, I don't. Ever. I need to get dressed before I leave my room. Pajamas are a cozy way to let the morning slide right on by. Even when I plan on showering later in the morning, I still need to get into regular clothes as soon as possible. Contacts are required. There is something about having my glasses on that makes it hard for me to focus. It isn't that I can't see, although the fuzzy periphery might have something to do with it, it is that glasses signal rest time to my mind and I follow suit. A time limit on the morning Internet. Due to my previous work habits, I am very capable of spending hours refreshing the Internet. I need a hard stop time and make myself abide by it. Shoes. I don't feel like I can work without shoes on. The shoes need to be put on immediately after my Internet time is over. Breakfast. This meal cannot be pushed to whenever. We need a time we will not pass before eating. Nobody functions well on low blood sugar and late meals. I want the breakfast prep to start around 8am. So those are my first goals for our new schedule. Most of them center around disciplining myself in order for the day to flow. If I am ready to go in the morning, I think the rest will be easier to tackle. The alarm will be set on Monday morning.